The Bahama leather corner sofa suite is also available in black or brown leather. You won’t be disappointed because this sofa is upholstered in a soft cut of premium bonded leather and all of the non facing panels have a leather match. It is soft to the touch and exquisite to sit on. The Bahama has pocket sprung seating for your comfort and the back cushions are generously padded for added enjoyment. You will be amazed at the quality of this leather sofa for the price that you pay. It can be distributed quickly and you can choose which corner orientation you prefer, left hand or right hand facing and don’t forget about the complimenting modern designed arm chair. We desrcribe our sofas as we look at them. Here is an example. Madrid Black Faux Leather Suite Sale! Bailey Reversible Black Leather Corner Sofa Sale! 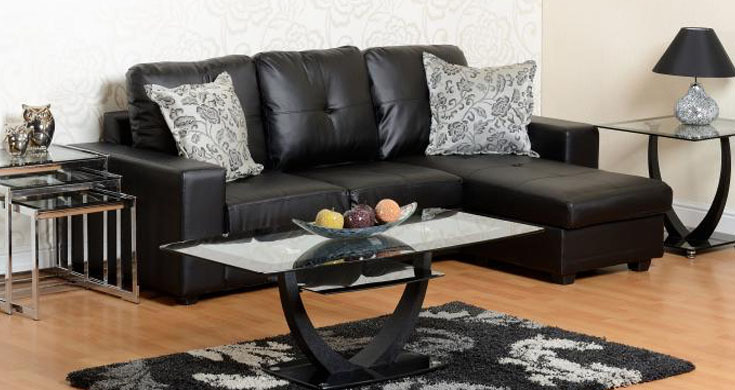 Thames 2 Seater Black PU Leather Box Sofa Sale!